It’s one of those rare occurrences that you see unfold on the evening news but don’t believe could happen to you or anyone you know. But it can and it does. And if that occurrence involves something that you are alleged to have “missed” in your inspection report, the result can be devastating to you and your business. Here’s a real life story. According to the North American Deck and Railing Association (NADRA), there are over 40 million decks in the United States over 20 years old. While there are no clear statistics on how many people are injured annually in a deck collapse, the most recent study by the U.S. Consumer Product Safety Commission found that over 20,000 people were hurt by the structural failure of a deck or porch over a five year period in the early 2000s; putting the number of injuries from deck and porch failures at over 4,000 per year. When compared to the aggregate of injuries nationwide, this makes deck failure injuries relatively rare. 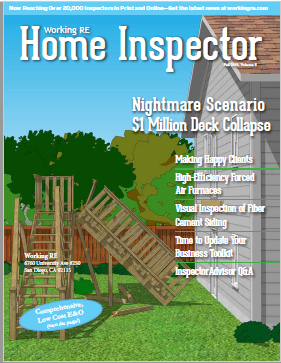 The rarity of a total deck failure means that home inspectors seldom face these types of claims, yet when they do occur, they can be very costly. This means that properly inspecting a deck, as well as using the appropriate disclosures and disclaimers, is of critical importance to inspectors. This is the true story of a home inspector’s worst nightmare: the homebuyers move in, throw a party and the deck collapses with eight guests on it. The inspector is blamed for not properly identifying the deck as a safety issue. The result is six personal injury lawsuits against the inspector leading to inexhorbitant defense and settlement costs. Several years ago, homebuyers Bill and Melinda Smith are in the process of purchasing a 4,000+ sq. ft. home with a sizeable deck. 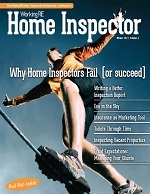 To inspect the home, they hire XYZ Home Inspectors, a multi-inspector firm owned by Aaron Johnson. Johnson’s son, Alex Johnson, inspects the Smith’s desired home and finds no major issues. The Smiths close on the home four weeks later and move in. Less than 30 days after moving in, the Smiths host a party and invite several friends over. Later that evening, the unimaginable happens: the deck collapses. A total of eight people, the Smiths and six of their friends, are on the deck when it collapses. According to the fire department chief who responded to the scene, six of the eight individuals who were on the deck had moderate, non-life-threatening injuries and were taken to the hospital. These fictitious names of the six individuals hospitalized will help keep their stories straight: Bill and Melinda Smith (homeowners) and their friends Bob and Sandy Miller, Janet Wilson and Clark White. Less than three months after the deck collapsed, the Smiths filed a lawsuit against both XYZ Home Inspectors (the LLC) and the inspectors Aaron and Alex Johnson for negligence and breach of contract. In the inspection, Alex Johnson noted a safety issue with the deck, but the note was specific to the railing. The other comments on the deck in the report simply recommend that the Smiths “monitor” the issues. Safety Issue: The deck railing is loose. It is recommended that this be repaired for improved safety. Improve: The deck should be painted or stained to improve durability. Monitor: The deck is showing signs of wear and age. Some improvements may be desired but it is in generally serviceable condition. Monitor: The deck does not appear to be lag bolted to the exterior of the home. Current building practices require that decks be properly secured to the home with lag bolts. If this home is over 10 years old, it may have been built prior to these requirements. While Johnson’s report does mention that the deck was not lagbolted to the exterior of the home, the Smiths allege in their lawsuit that the Johnsons failed to inform them the deck was “an immediate safety concern” and that the deck “was susceptible to collapse…and in need of immediate repair or replacement.” The lawsuit also alleges that Alex Johnson “failed to verify that there was a positive connection of the deck to the home” and instead of warning the Smiths about the danger, suggested that they simply “monitor” the deck, per the inspection report. Both of the Smiths alleged that they incurred, and will continue to incur, medical expenses and loss of income because of their injuries. They also alleged that they incurred damage to their home, including the deck, resulting in a diminution of value in the home. Almost a year after the Smiths filed their initial lawsuit, party guests Bob and Sandy Miller filed an Intervenor Petition, which allowed them to join the Smiths’ lawsuit as plaintiffs. The Intervenor Petition begins by leveling claims against the Smiths, alleging they “knew or by using ordinary care should have known of the dangerous condition posed by the second- story deck.” However, court filings explain that the Smiths and Millers entered into an agreement wherein the homeowner Smiths assigned to their guests the Millers “all rights and/or causes of action the Smiths have or may have” against XYZ Home Inspectors and Aaron and Alex Johnson so they could join the suit and file a cross-claim against XYZ Home Inspectors and the Johnsons. The Miller’s list of injuries was long, including “right shoulder tear, bicep tendon tear, rotator cuff tendinopathy, right carpal tunnel syndrome, T12 burst fracture, pelvic fracture, fracture of fifth metatarsal left foot, left knee MCL sprain, post concussive syndrome, inability to perform activities of daily living, significant cosmetic injury, loss of enjoyment of life,” and much more. The Smiths (homeowner plaintiffs) pointed out that as members of several professional home inspector associations, the inspectors had a duty to inspect to certain standards but failed to do so. The inspectors prominently advertised their membership in these organizations on their website and other marketing materials, which made matters worse. The Millers included a claim that the Johnsons were in violation of state consumer protection laws because XYZ repeatedly stated in their marketing material that “We back up our findings with ironclad guarantees. We pay for repairs. We hold ourselves accountable.” XYZ also repeatedly warranted their work with an “iron-clad” 120-day “if we pass it, we will protect it” assurance guarantee. Yet their inspection agreement included language indicating that “This inspection should not be considered a warranty or guarantee of any kind” and contained a clause limiting their clients to nothing but the return of their inspection fee in the event of a claim. In the same way that the Millers joined the Smiths’ lawsuit against XYZ Home Inspectors and the Johnsons, Clark White filed an Intervenor’s Petition and joined the lawsuit. White also claimed to have sustained substantial injuries, including “L2 burst fracture with retropulsion of fracture fragments, comminuted, displaced right hip fracture, left lateral tibial fracture, significant physical pain and suffering, loss of enjoyment of life,” and more. The remainder of White’s petition for the most part contained an explanation of damages and allegations that mirrored those of the Millers. Unlike the Millers and White, Janet Wilson chose to file a separate lawsuit against XYZ Home Inspectors and the Johnsons. In her very short, three-page complaint, Wilson alleges that the Johnsons had a duty to report that the deck was in dangerous condition to the Smiths, and as a result of the breach of their duty to the Smiths, Wilson sustained severe injuries. Wilson’s injuries included “injury to her right foot, injury to her neck, loss of earnings, diminution of earning capacity, loss of household contributions,” and more. For their part, the Johnsons argued that XYZ Home Inspectors was a limited liability company (LLC) and as such, the father and son “cannot be held individually liable for work performed as agents or employees of the company.” They also argued that the guests at the Smiths’ house, including Janet Wilson, had no business agreement with XYZ and as such, no cause of action to sue their company or them individually. The Johnsons’ defense went on to cite multiple sections of the Inspection Agreement wherein it specifies that the liability of XYZ is “limited to a refund to the client of the fee paid.” The agreement also had an arbitration clause which the plaintiffs chose to ignore by filing in civil court. Finally, the Johnsons had a clause in their agreement that required the Client to agree “that any claim alleging failure to accurately report a visually observable defective condition of the subject property shall be made in writing and delivered to the Inspector within two (2) business days of discovery” or else the Client would be waiving any right to make a claim, which the Millers failed to do. The Smiths also filed a claim with their homeowner’s insurance, seeking damages for the collapsed deck and to cover the personal injuries of their guests. The home insurance company initially denied the claim, arguing that the deck collapsing was outside the scope of the homeowner’s insurance policy. This led the Smiths to sue the insurance company for breach of contract. The insurance company counter-sued the Smiths in an attempt to make the claim go away. Ultimately the homeowner’s insurance company agreed to pay $225,000 to the Millers and Mr. White for the injuries they sustained, with both the Smiths and their guests retaining the right to pursue XYZ Home Inspectors and the Johnsons for further damages. Despite the Johnson’s strong contract wording, all of the plaintiffs’ cases against XYZ and the Johnsons are believed to have resulted in over $1 million in defense and settlement costs. This is in addition to the $225,000 paid to the Millers and Mr. White by the Smith’s homeowner’s insurance company. 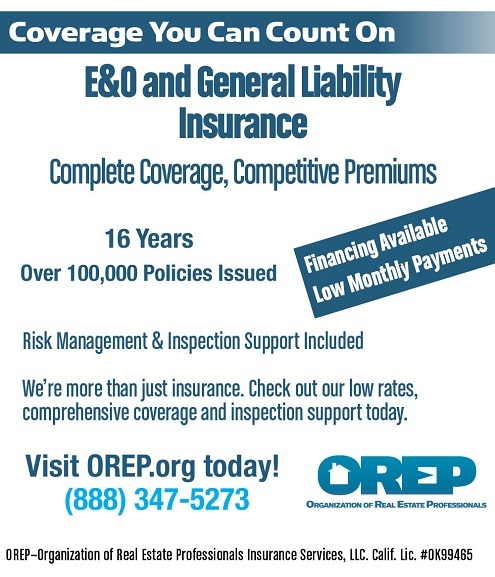 This story highlights several important lessons for home inspectors, according to David Brauner, Senior Broker at OREP E&O insurance. “First, home inspectors should be very careful when inspecting decks to note any safety issues or potential safety issues. When it comes to a high, second-story deck, the home inspector should carefully observe the construction of the deck and its attachment to the building. Any potential issues should be highlighted and strongly called out,” says Brauner. Isaac Peck is the Editor of Working RE magazine and the Director of Marketing at OREP.org, a leading provider of E&O insurance for appraisers, inspectors and other real estate professionals in 50 states. He received his master’s degree in accounting at San Diego State University. He can be contacted at isaac@orep.org or (888) 347-5273. I am sorry for those people and their injuries, however I think the Home Inspection covered enough to exempt them from liability. My question would be how much furniture and people were on the deck in how small an area. A deck can’t hold an unlimited amount of weight no matter how well built. I agree, but I doubt this was a furniture issue and 8 people on a deck is nothing compared to 15-20 people during a party. Decks can sustain a fair amount of weight if built properly. I have seen large decks with a single beam in the front and the back of the deck attached to the house. The attachment to the house in this case is a critical point. As was stated, there was underlying rot that a inspector would not have seen, BUT the more important point is that the inspector noted that “lag bolts” were not used in the attachment which would lead me suspect an improperly constructed deck. What did they use, nails !!! For a large deck, I would have flagged this and recommended it be looked at by a deck professional. Personally, I am seeing many decks that have a secondary beam near the back of the deck such that the attachment to the house is no longer a failure point. My deck is built this way because I have “I truss joists” in the basement and could not lag into this as its not a solid piece of wood. With many finished basements, inspectors may not see what the joist material is made of. Scary situation all around.